Dr. Marie Laberge-Malo has made an exemplary contribution to the well-being of families who are suffering and striving to rebuild. Known for her tremendous generosity and leadership, she is a reference in North America and in the French-speaking world. She is the only physician in Québec to specialize in both pediatrics and physical and rehabilitation medicine. She is a source of inspiration for the doctors of tomorrow, her colleagues, and, above all, parents of sick children. Dr. Laberge-Malo is committed to development and research in the field of pediatric rehabilitation medicine, in order to maximize the “biological” restoration and development of children’s physical, cognitive, and psychosocial capacity within a holistic treatment plan. 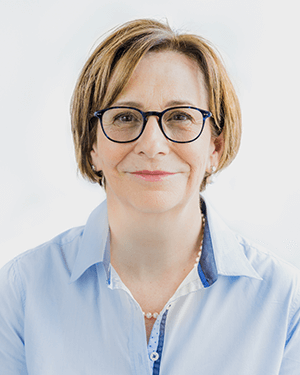 She has developed a network of continuous rehabilitation services with the CHU Sainte-Justine’s acute care centre, the Marie-Enfant rehabilitation centre (CRME), and the Bouclier regional rehabilitation centre in Ste-Agathe-des-Monts. In addition, she has initiated multidisciplinary partnerships within and between hospitals to treat patients with complex illnesses (dysphagia, bone disorders, deformations, brain injury, spinal cord injury). These patients often end up being referred to numerous specialists, resulting in fragmented care. Dr. Laberge-Malo also works at Montréal’s Shriners Hospital. She ensures her young patients a smooth transition to adult care by providing a clinic in the Institut de réadaptation Gingras-Lindsay de Montréal (IRGLM) in partnership with colleagues specializing in adult care. Every day she pushes her colleagues to surpass themselves, urging them to put children at the forefront of their concerns. In this way, after much perseverance and effort, she managed to change the admissions process to the Marie Enfant rehabilitation centre, the only superspecialized rehabilitation centre in Québec for children under 18. The waiting list was shortened, and children were finally able to receive care within a reasonable period. When it came to funding, Dr. Laberge-Malo marshalled her strategic and leadership skills to mobilize donors, parents, and caregivers to support the acquisition of sophisticated rehabilitation equipment. This allowed her to design braces to reduce the pain of children suffering from scoliosis and lordosis. She also created innovative techniques for visualizing choking problems, ultimately proposing personalized eating solutions adapted to each child. Dr. Laberge-Malo’s expertise is also respected in European congresses such as the SOMFER (Société Française de Médecine Physique et de Réadaptation). It was her idea to acquire a Lokomat device, the first seen in Québec, to help young brain and spinal cord injury patients learn to walk again. In so doing, she gave joy and hope to hundreds of children and their parents. Many parents have spoken of her commitment to the healing process, and her humane and non-judgmental approach. Her priority is to provide excellent care, a loving presence, and support for others, particularly those who are suffering in their bodies and souls. Dr. Laberge-Malo is not only an extraordinary physician, she is also genuinely committed to families. Her attentiveness, time, and intuitive sense extend well beyond her professional duties. In fact, she is still involved in her community, as evidenced in her support for children in the African country of Gabon, and, for the past 12 years, as a board member and advisor for the Centre Philou, an organization that supports families of children with multiple disabilities. Marie Laberge-Malo is a true agent for change when it comes to healing, putting in place all the elements families need to rebuild.